A Major Soldier is part journey of discovery for the author and part history of the 1st Essex Battalion in the First World War. Frank Bailey was typical of many veterans of the era in that he never spoke of his exploits, despite having a long army career predating the war and being awarded the DCM. The author, his grandson, only found out the full details of his military service after his death. The author reminisces about his memories of his Grandfather before detailing his research into his life and military career, a journey that ultimately uncovered a hitherto unknown brother who had died in the war. The book then moves on to the actions of the 1st Essex battalion in the war, focusing on Gallipoli, the Somme, and Cambrai. Whilst the focus on the 1st Essex is well-crafted, the analysis of the campaigns in which it was involved is brief and will not really add anything to those who are already familiar with them. In some of its more descriptive passages, it is also not clear if what is written is based on supposition or documentary evidence, and clearer more detailed referencing would have satisfied my curiosity further. The focus on Frank’s military career ends with a brief aside into his, and the battalion’s, post-war service in Ireland and the role Frank played in the Second World War, and a summary of the battalions’ history. 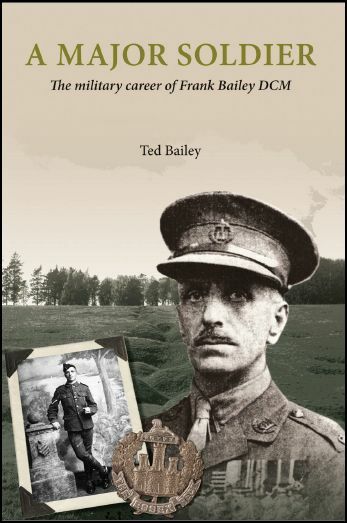 The strongest sections of the book relate to the author’s search for information, and the details of the career which saw Frank Bailey rise from the rank of Private to Major. The ‘search diary’ appended to the book will strike a chord with anyone who has carried out family history research and conveys some of the frustration and impatience that one feels when trying to research a military ancestor. Some areas that are mentioned would have benefited from further details, for example the attempts to track down Frank’s medals; one can only presume from the lack of pictures that this proved to be a dead end. Relevantly illustrated, overall the book pays homage to an undoubtedly brave and modest career soldier.